The restoration of the former Zonnestraal aftercare colony is an ongoing project. Work on a section of the complex was recently completed, and Jeroen Mensink went to Hilversum to take a look. The first thing that strikes you as you approach the building is the glazing, in terms of both quantity and extreme transparency. The glass seems more transparent and whiter than the contemporary glass we see around us today. And this is no illusion, for rolled glass as opposed to plate glass was installed. Rolled glass is no longer manufactured in Western Europe, but production continues in Lithuania. Because of its irregular structure, rolled glass does not form a perfectly smooth mirror. Rather, it reflects the light and surroundings evenly, thus making the glass surface less visible. 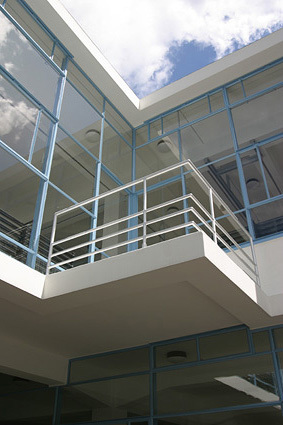 What's more, rolled glass contains less iron than plate glass does – more iron means a lower melting temperature – and that is why rolled glass does not have that green sheen we are so familiar with in glazing today. Instead, rolled glass is crystal clear and colourless. How about that for progress! The frames of the double glazing are even more surprising. The outer sheet is of rolled glass and the inner sheet of American extra-clear flat glass. Maintaining the cavity between the two is grey PVC instead of aluminium. The total thickness of the double glazing is a mere 11 mm – a full millimetre less than windows of the recently renovated dispatch building at the Van Nelle Factory – and that means it snugly fits into the extremely slender frames. The formation of condensation isn't prevented. To counter the cold-bridge effect, condensation is simply collected in a small channel in the windowsill. Duiker himself applied this novelty in their later pavilions after encountering the problem of moisture condensation earlier on. When built, Zonnestraal was surrounded by an extensive area of heath. Today dense woodland surrounds the complex. 'When are you going to cut those trees?,' John Körmeling, full of admiration for the building, asked the guide. Trimming the trees would indeed enhance Zonnestraal and restore the situation that existed at the time of the building's completion: an abstract volume floating in a natural landscape. To be continued in the years ahead. The restored main block gleams as new today. It is one of the few truly white buildings of the Modern Movement. The limitations of black-and-white photography make it seem as though all early modernist buildings were snow white, but the truth is that most were actually lightly coloured; many were cream or light yellow in colour, others brown or even blue. White wasn't part of the colour scheme for Villa Sonneveld in Rotterdam, for example, not even in the interior. At Zonnestraal, by contrast, sunglasses are required on a sunny day. Built on the initiative of the Union of Diamond Workers, the sanatorium was painted white by the patients themselves. While recuperating from tuberculosis, patients underwent work therapy to smooth their path back into society. Work therapy made it possible to keep the complex in perfectly white condition and to prevent corrosion from affecting the steel window frames. 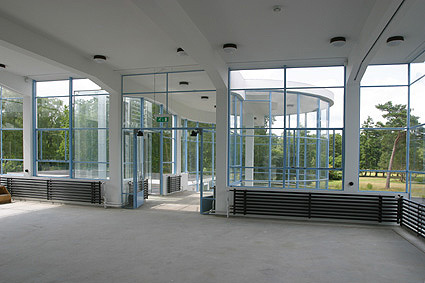 The complex designed by Duiker in the woods near Hilversum is being restored in phases. Major repairs started in 1995 with the restoration of the service block by students from the Delft University of Technology, and work on the main block was completed two weeks ago. The badly dilapidated Dresselhuys pavilion was hidden from view behind a Christo-like wrapping, as though such a sorry sight might disturb the festivities. Restoration of this pavilion is planned as follows. Back in 1983, the Department of Building Conservation and Monuments designated Zonnestraal as a 'pilot project' for testing restoration techniques on early Modernist buildings. Hubert-Jan Henket and Wessel de Jonge were involved as researchers right from the start, and since 1993 they have acted as collaborating architects responsible for the restoration. Henket and De Jonge, who set up the DoCoMoMo Foundation, received knighthoods for their work in preserving modern built heritage. The first part of the complex to be restored was the service block, carried out by students of Delft University of Technology under the leadership of Joop van Stigt. Henket and De Jonge completed the restoration of the workshops in 2002 and the main block in 2003. The restoration of the Dresselhuys pavilion is at a preparatory stage, and the entire complex and surrounding landscape will be restored to the original condition by 2010. Ironically, Jan Duiker himself vociferously opposed the preservation of architectural monuments. He even advocated the demolition of buildings that had fallen into disuse. He thought his building had a lifespan of 30 years; now it's become a permanent monument. 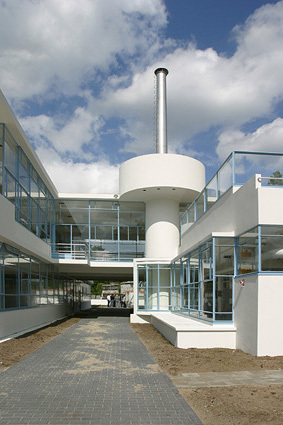 Zonnestraal aftercare colony, a sanatorium for tuberculosis patients, was built in 1926-1931 to a design by Jan Duiker and Bernard Bijvoet and is one of the best-known functionalist buildings in the Netherlands.